In 2003, Canada’s Centre for Science in the Public Interest (CSPI) was successful in establishing a Canadian nutrition label standard that has served as a model for the rest of the world. By illustrating detailed content information on labels, the Canadian consumer has been provided with the opportunity to compare different foods and make choices based on ingredients and nutritional value. Since its inception in 2005, the monetary value of nutritional labeling has been estimated to be as high as a billion dollars per year. This has been achieved primarily through lowering healthcare costs associated with cancer, heart disease and diabetes, while increasing worker productivity as a byproduct of a healthier lifestyle. The Nutrition Facts table includes five separate categories of essential information that when taken together, provide a detailed representation of the content of the food. Understanding the meaning of the categories and the values associated with each one will make comparing two products easier while providing opportunities to increase or decrease intake of a specific nutrient. It is important to remember that not all foods or consumable have a Nutrition Facts table. These include raw meats and chicken, alcohol, processed or prepared foods such as baked goods, sandwiches or salads, and foods that have essentially no nutritional value such as tea or coffee. The first important area of the label is the specific amount of food. This is the quantity of food the manufacturer has determined would be consumed as a typical portion. In evaluating similar foods from different manufacturers, it is critical to recognize that the balance of the labels nutritional value is based on the serving size and it isn’t always consistent. Therefore, this knowledge can be used to compare the label quantity to one’s own consumption habits, as well as to other manufacturers of similar items. Most often, the specific food amount is provided in weights and units, as in two cookies with a weight of 25 grams. Other loose foods such as nuts, pretzels and candy have specific food amounts identified as portions including the number of pieces in a portion, and the approximate weight of the portion itself. Foods that have a variety of optional add in ingredients such as cereals that may include an assortment of different fat content milk will provide separate nutritional value columns for each of the most popular methods of preparation. The % Daily Value provides a universal measurement that can be used to compare like and dissimilar foods for the purpose of evaluating the effects of consumption on the entire diet. For example, when attempting to increase fiber intake, two cereals can be compared to see which one offers the maximum daily percentage with a similar size portion. Conversely, comparing and selecting foods with a lower per portion content of harmful ingredients such as fat and sodium will lead to healthier consequences. Those manufactures that produce foods that contain at least a 15% value of iron, fiber, calcium, and vitamin A, are allowed to list the content of these nutrients as “high source.” Foods that have at least a 30% daily value of vitamin C can label that content as “high source” as well. Additionally, foods that contain 5% or less in the daily value of fat, sodium or cholesterol, are allowed to be labeled as “low in” those specific unhealthy nutrients. A daily value of less than 10% allows a food to be labeled as “low in” either saturated or trans fat. These are very powerful tools to use in selecting proper foods for nutrition and healthy eating. The % Daily Value listing on a label can be used as a general guide in choosing foods that are either low in undesirable nutrients or high in healthy vitamins, minerals and fiber. It can also be used as a very specific way to limit or raise the daily percentages based on the type of foods chosen and the manner in which the food is prepared. 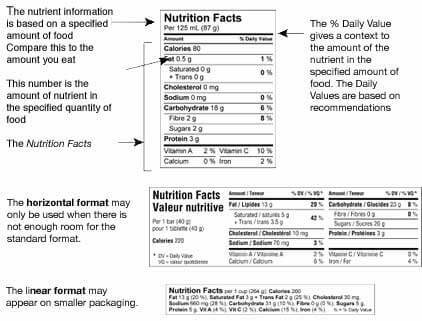 Calories and specific nutrients are required to be listed in the same order on every food label regardless of the food itself or the manufacturer. It is important to understand the effect of calories and individual nutrients on a healthy diet. Calories: Calories as a number are always listed based on the portion size in the specific food amount section right below the Nutrition Facts label. Therefore, those calories as listed would be the amount consumed in one portion. If more than the amount specified as a single portion is eaten, more calories will have been consumed as a result. Therefore it is essential to determine the desired amount to be consumed, and multiply the calories by that factor. For example; if a single portion of food contains 300 calories, consuming 1.5 portions will increase the caloric intake to 450 calories. Consuming the proper number of calories per day varies based on health, age, activity level, body type and gender. To determine an individual’s specific caloric needs, consulting directly with a physician would be advisable, especially when starting a diet for the purposes of weight loss. This is also especially important when a woman is pregnant or breastfeeding. Fat: The total fat content of a particular food includes saturated fat, trans fat and any other soluble fatty acids contained within the food. Fat content is further broken down so that the consumer can identify the trans fat and saturated fat content of the food based on a single portion and listed as a percentage of daily consumption. These two types of fats are particularly dangerous when consumed in excessive quantities and foods lower in fat content are much healthier choices. Saturated fats have been shown to increase blood LDL cholesterol levels which is a significant risk factor for heart disease. Trans fat has a tendency to reduce HDL cholesterol which is actually a fat that plays a positive role in heart health. In short, choosing a diet low in saturated fats and may reduce the risk of stroke and associated heart disease. Vegetable oils are particularly susceptible to high levels of trans and saturated fats. It is better to select oils that are based on canola, olive, corn, sunflower, soybeans or peanuts. Hard margarine, lard and butter should be limited in consumption and oils based on palm, coconut oil or hydrogenated vegetable oils should be avoided whenever possible. Cholesterol: This is an optional inclusion on the nutrition label, but it is another nutrient that should be limited based on negative health consequences, and never consumed in quantities that exceed the 100% daily value. Sodium: Excessive sodium, acquired largely from salt, is a leading contributor to high blood pressure which can lead to stroke or other heart disease issues. Most people consume more than enough sodium by eating processed foods such as canned soup, canned fish and processed meats. Sodium is also a primary component of many food additives such as sodium nitrate, or sodium gluconate. It is a healthier choice to limit foods with high sodium content. Carbohydrates: Carbohydrates are listed by total content, which includes starches such as pasta, rice and potatoes, sugars and fiber. It is important to recognize that carbohydrate consumption has a significant effect of weight gain. At the same time, a proper diet must include complex carbohydrates to maintain a normal metabolism and sufficient energy levels necessary for daily activities. Specific listings for fiber and sugar content are directly below the Carbohydrate heading. Fiber is a necessary nutrient that promotes a healthy digestive track. It can be found on such foods as whole grain products, certain breads and cereals as well as a variety of vegetables and fruits. Sugars are a naturally occurring substance found in many foods including milk, fruit, and most vegetables. Sugars are often added to foods in order to improve their taste but generally do not contain much nutritional value. Therefore there is no % daily value for sugar as there is no consensus as to how much sugar should be consumed daily. Sugar additives come in a variety of configurations such as sucrose, fructose, dextrose, molasses, honey, maple or corn syrup. Those with diabetes or other blood sugar diseases should watch their sugar consumption carefully. Sugar and sugar additives can also play a role in tooth decay. Proteins: Proteins are listed in terms of weight, but do not carry a % daily value. This is due to the fact that protein consumption is adequate for the typical Canadian. Protein is found in a variety of foods including meats, fish and poultry as well as many varieties of peas, beans, nuts and dairy products. Vitamin A- Vitamin C- Iron- Calcium: Listings for these essential vitamins and minerals are based on a recommended consumption. They are shown only as a % daily value to make comparisons between foods easier and to help in preparing diets that provide for the proper intake of each nutrient. Canadian nutritional labeling standards do not require manufacturers to list any other nutrients in the food beside the essential 13 core nutrients as spelled out by the standard. Manufacturers may elect to include further nutrient content outside the Nutrition Facts Label, such as other vitamins, minerals, specific types of fat, alcohols or sugars. Although manufacturers are allowed to make true and accurate nutrition claims, the government has very specific requirements that must be met. The same rules apply to all foods and labels, so the consumer can be certain that claims from one food or manufacturer to the next will always be consistent. Reduced: Must contain 25% less of the nutrient than a standard product. Canada has successfully created a nutrition label standard that continues to serve as a model for the rest of the world. Whether using the nutrition labels to increase consumption of healthy nutrients or reduce consumption of harmful nutrients, food labels provide a level playing field for comparing different types of foods from different manufacturers. As always, it is important to remember to consult a physician before starting a diet or significantly changing eating habits, but nutrition labels can make the task of selecting healthy foods much easier.